The London stock market edged higher, in advance of an interest rate decision by the US Federal Reserve. 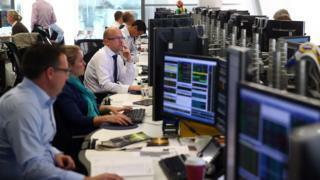 The benchmark FTSE 100 closed up 10 points at 7,368, helped by strong gains for mining shares. The biggest winner on the FTSE 100 was pharmaceuticals firm Hikma, which rose 8% after reporting stronger than expected annual results. House builders were among the losers, with Persimmon down 1% and Taylor Wimpey falling 0.7%. Analysts said that a warning from the Royal Institution of Chartered Surveyors (Rics), was weighing on building shares. Rics said the UK construction industry could lose almost 200,000 workers from the European Union after Brexit. On the currency markets, the pound rose 0.52% against the dollar, to $1.2219. Against the euro, the pound also rose, trading 0.3% higher at 1.1491 euros. Policy makers at the Fed are expected to raise interest rates, with the decision due at 18:00 GMT. A news conference, held half an hour later by Fed chair Janet Yellen, will be closely watched for any clues about future rate increases. "The Federal Reserve is a dead cert to raise rates on Wednesday, so the key question is how far and how fast the US central bank will tighten monetary policy this year," said Neil Wilson, senior market analyst, at ETX Capital. "Fed officials believe there will be three 25-basis-point increases in 2017, the first of which is almost certain to be announced today. But the policymakers on the Federal Open Market Committee could raise this to four," he added.